Submitted by Dave Hodges on Friday, April 5, 2019 – 12:26. First Venezuela, then South Africa, then the United States. Gun confiscation is always the prelude to genocide. History speaks will America listen? Gun control and ultimately gun confiscation has begun in earnest inside of the United States. Prior to reporting on the simultaneous gun confiscation programs that have begun in earnest in multiple locations, I would first like to visually and graphically present an historical lesson about the dangers that gun control/confiscation poses to a population at the hands of their government. I once interviewed Paul Martin regarding door-to-door visits by law enforcement all around the country. This is increasing exponentially as evidenced by ex-California Governor Jerry Brown’s Moon-Beam Militia and they are asking residents if they have registered guns. Paul Preston, from Agenda 21 Radio is aware of this as well. People wonder why I am so opposed to any UN troop presence on American soil. Under the Kigali Principles, the UN has granted itself the right to forcibly enter the sovereign territory of any nation and enact WHATEVER policies they deem necessary to restore the country to a level of normalcy that the UN deems appropriate. Under Obama and former Secretary of State, John Kerry, they both signed the UN Small Arms Treaty which effectively bans all private ownership of guns. If these UN troops ever gain a foothold in America, And there are many people in our country who say this day will never come. Let me remind you, or perhaps reintroduce the evidence that the UN has resources stored inside of our country that will be used by their so-called “peacekeepers” when that day comes that UN troops are rolling down the streets of America. Here is one very small piece of evidence that has already been documented on The Common Sense Show. UN Vehicles housed on abandoned US military bases such as this one in Hagerstown, MD. Someone should ask the current President why these vehicles have not been destroyed as a direct threat to American sovereignty and national security? Given the track record of the United Nations in previous genocides (eg Rwanda and soon-t0-be-South Africa), I view the presence of any UN personnel and equipment on American soil as a direct and personal threat to both my family and my country. Make no mistake about it, the UN is here to take your guns. They will finish the job that the states are unable to complete. Gun Confiscation Orders (ie Red Flag Laws) which have been passed in 13 states with sage four liberalism. Currently, Senate Judiciary Chairman Lindsey Graham has said that he’s working with anti-gun fanatic Sen. Richard Blumenthal (D-CT) to craft a Gun Confiscation proposal. S. 7 is currently the only “red flag” confiscation bill in Congress. And it is extreme as the liberal authorities can convene a “secret court” where neither the targeted gun owner nor his attorney is allowed to appear. The secret court “hearing” is so draconian it can be conducted by telephone. Find hiding places for some of your guns. Refuse to answer questions when the police come to your home and are attempting to violate your Second Amendment rights. 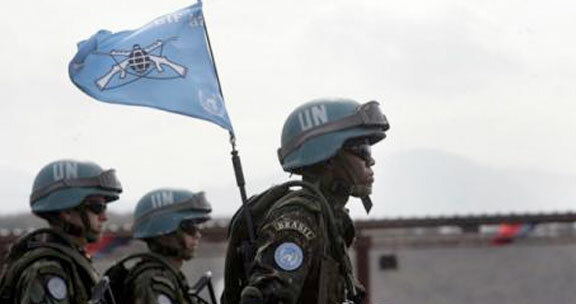 Previous PostPrevious REVEALED: UNITED NATIONS SIX-MILLION MAN INVASION FORCE HEADING TO AMERICA!